There are a few go-to soup recipes that I make over and over again, and this lentil vegetable soup is a big favorite at our house. We enjoy soup all year long, even during the summer, and I love its simple, healthy list of ingredients. After Larry’s heart attack a year ago, I donated all the canned, salty soup from our pantry and took on soup-making with a vengeance. I use either homemade or boxed low sodium chicken or vegetable stock as a base. Last week I thought I was coming down with a cold and threw together a batch of this lentil soup. I have learned to prefer the French green du Puy lentils and had a box on hand. Cumin and curry powder give a subtle smoky taste to the soup and the orange zest adds brightness. I play with different vinegars, enjoying the piquancy from their sharp bite. Organic onions, carrots and celery are inexpensive and well worth it. The trick with lentils is to remember that they have an incredible capacity for absorbing liquid the longer they sit. I almost always add more stock when I am reheating leftovers. TIP: You can double this and freeze half a batch. 1. Heat the oil in a large, heavy-bottomed pot. Add the onions, carrots and celery and cook until the onion is limp and the other vegetables brightly colored from the heat. 2. Add the lentils and stir into the sautéed vegetables. Stir in 4 cups of the stock. 3. Add the curry, cumin and orange zest. Season with salt and/or pepper. Simmer over low heat until lentils are tender, about an hour. 4. Add the vinegar and remaining 2 cups of stock. Cook over medium heat until soup is hot. 5. Garnish with parmesan and/or parsley and serve. This recipe is dedicated to my friend, Susan, whose wonderful blog The Wimpy Vegetarian burst onto the scene last October. Thank you for including me in those awarded the Liebster Award. Happily, it is my turn to include five other women and their lovely blogs. Now it is your turn to pass along the blog award to five other food bloggers with fewer than 200 followers. Copy and paste the link and link back to this post. Congratulations! Thank you, Denise – I’m trying to model you and incorporate more vegan recipes into my cooking. Oh, I love soup and this is a soup that I am going to make. I am humbled that you made a shout out for my blog. You rock and keep being yourself, Liz. We are better for it. We love lentil soup, too. The addition of curry and orange is so interesting – I can imagine it tastes delicious. Liz, I’m a lentil soup lover, too. Looks wonderful. Thank you so much for the award. I’m flattered to be included in the group. 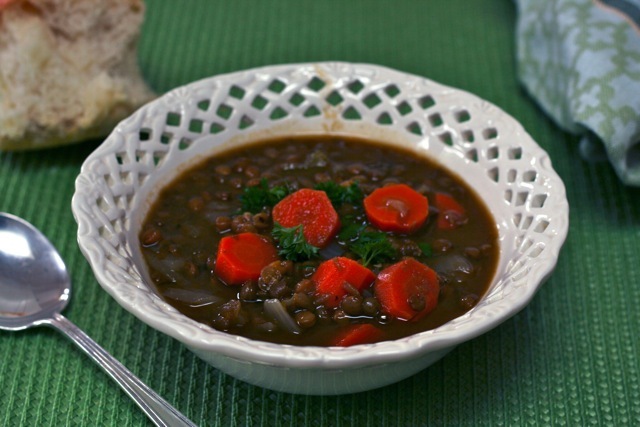 Lentil soup is one of my favorite soups! I’ve never used your curry-cumin-orange combination though, and I don’t know why when it’s one of my favorites. I’m bookmarking this to make next time I’m making lentil soup! Thanks for a great recipe! Now I’m going to go check out your liebster awardees!! Thanks again, Susan, for sharing the award with me! Lentil soup fan over here too!! And the photo looks great Liz. Congrats on the award, you deserve it!! Lots of love for you. I love the curry addition to the lentils! Thank you so very much for the award! Oh I am a lentil soup lover and soup-lover in general – and like you, make it year round. I like your idea of using the vinegar and also the curry. Definitely going on my dinner list for next week! Wonderful – I hope you like my version. I love red pepper flakes too, Greg, but add separately because Larry chokes on them. Yes, this is tasty soup! And I don’t usually like lentils, but only because they tend to not agree with me. I am so honored to have been selected by you for this award. It has been such a Pleasure getting to know you, seeing you at local events and reading about your life on our blog. 🙂 Thank you thank you thank you!!!! It has been awhile, maybe a year, since we’ve had a bowl. Looking outside at a other gray day, I might har to change that! Thanks, Kim, see you twice next week!